On 1st June, I attended a day time mini wrestling show in a night club Lancashire. I am passionate about wrestling and many British wrestlers who I frequently have seen live were performing. The show was followed by a question and answer session, guesting American talent who gathered their fame from participating in World Wrestling Entertainment (WWE) and World Championship Wrestling (WCW) and finally a meet and greet session. My intention was not to reveal my synchronicity but to cheat and inform the curious that I was a professional wrestler myself and the mask was my signature identity in the ring. I was coached by a wrestling acquaintance on what questions I might be asked: is wrestling fake? who trained you? etc. Naturally I wanted to anticipate and record reactions from the American wrestlers and depending how welcoming they were, I wanted to give them a copy of the mask for obvious broadcasting reasons: instagraming, tumblr, etc. Having been to so many wrestling shows, I was aware that surreal fashion statements are no holds barred (meaning in a wrestling match that pinfalls and submissions do not have to take place in the ring physically). I had boarded the train with my friends to journey to Lancashire and had still yet to give myself an identity, I was given the following suggestions: Black Widow, Boom Boom Lisa, etc. None of them made an impression on me. However, I bought a copy of Art Review and came to a photography showcase, featuring a professional wrestler Adrian Steel who I knew nothing about. A glamorous character he was which enabled me to think of Glam! The Performance of Style and the film Velvet Underground, who identified himself as Exotic Adrian Steel. So my identity was born: Exotic L Carter. I placed the mask on when we arrived at Lancashire Railway Station. We witnessed the usual warm up reactions from a few travelers and residents, glimpse like a bad habit and head down. There were a number of times when I had to ask for directions, and the response I received enabled me to feel that my mask may have disappeared and I was simply accepted into the community. Once we got the venue, a group of teenagers commented positively “ I love your mask.” So I presented my story, no questions were asked, possibly they were feeling quite intimidated. So far nothing unique to record until the show began. A British Wrestler, Dave Rayne performing a comedy speech before a match stood on the ring post closest to me and lip synced “What’s that?” so I blew him a kiss. After a few short but decent matches, it was time to move towards a small stage for the question and answer session. The wrestlers participating were Chris Masters, Goldust, Douglas Williams and Rick Steiner. I stood close to the front and caught the attention of Chris Masters. He encouraged Goldust to look at me, like he was comparing our faces. Goldust wears face make up over his entire head and face. Finally it was time to move onto the meet and greet and the group went our separate ways to meet individuals of our own choice, I stood in the queue to meet Amy Dumas who wrestled during the early noughties under the name of Lita and she is an athlete who I’ve admired for many years, nostalgically she was first human I saw articulate a moon-sault (backflip splash move in wrestling). Her response was minimal, I wondered if this was because she was versatile, having seen such beautiful tattoos on her arms. I wanted to ask her to describe the meaning of her tattoos to articulate a visual conversation but could due to the time limits for over 100 people waiting in the queue. 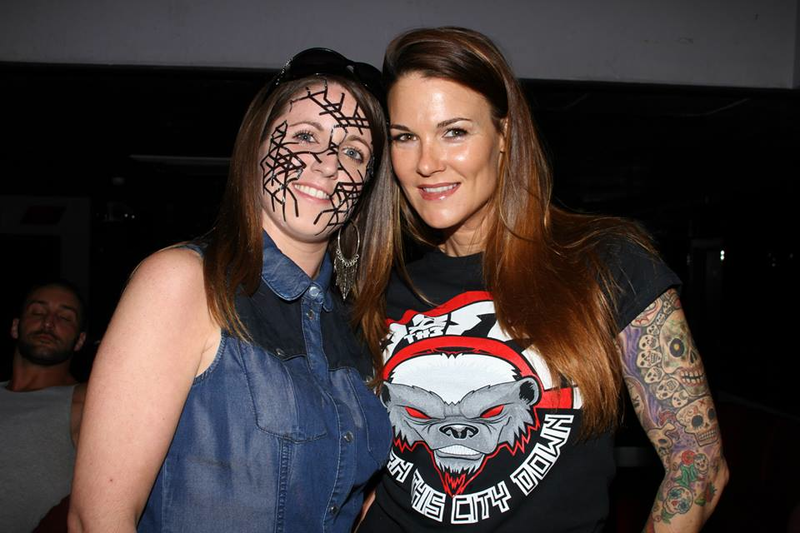 After meeting Lita, I moved onto to join the queue to meet Chris Masters who enthusiastically stated “Hey there sweetheart!” I’ve been waiting for you all night.” He seemed mesmerized as he studied the patterns on my face. I offered him a copy of the mask and talked through the instructions of how to place the mask on. He said he would instagram the mask. He is quite a vain character on social media so I have no doubt he will carry this through. 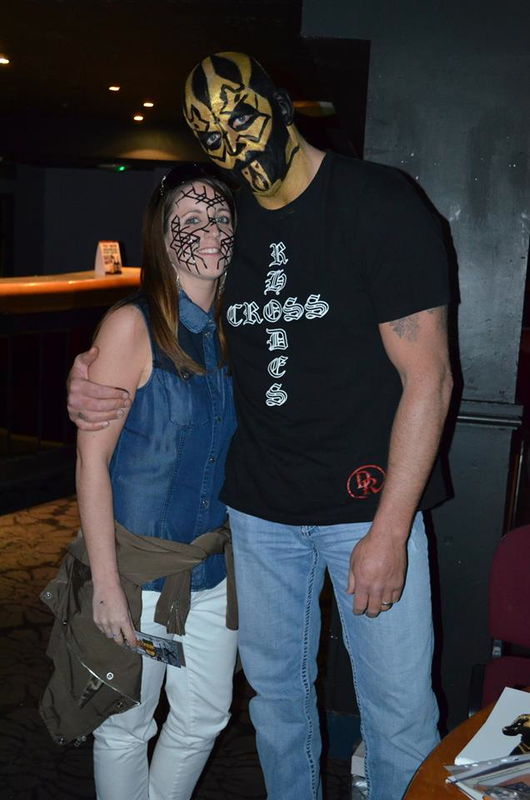 Next it was time to meet Goldust, when we came into contact he moved to Chris Master’s space to pick up the mask I gave him. He asked me about the purpose of the mask, I told him that I was a professional wrestler and he appeared to believe me. Then the conversation diverted to age restrictions in comparison to the UK and USA, I honestly have a memory block on how this subject emerged. 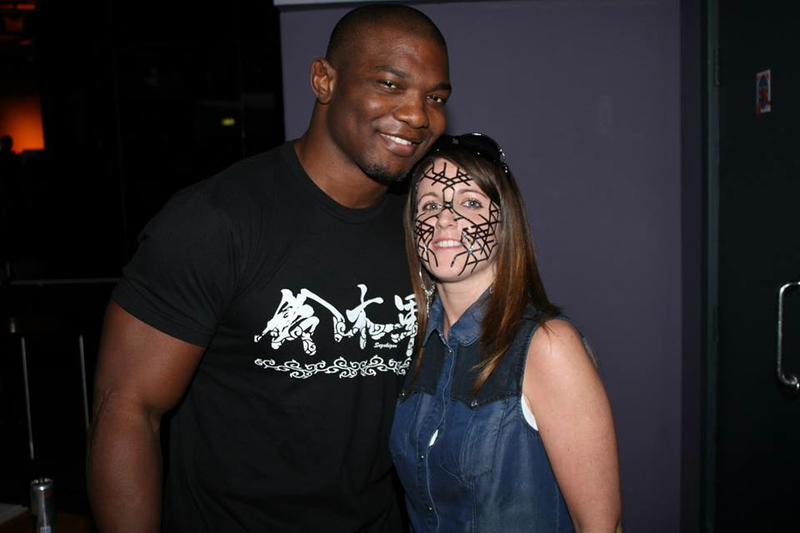 Finally I joined the queue to meet Shelton Benjamin. He said “Whats with the mask?” “I’m a professional wrestler.” “What name do you wrestle under?” Finally a sense of curiosity! I presented him my Adrian Street inspiration and he told me that he was very familiar with his life and performances. So finally decided to call it a day, remove the mask and reunite with my friends. Thinking the experience was over, well, not necessarily. Overall I have never felt more exposed in ‘the concept’ in comparison to any other time I have worn it. The best part of the experience was not the quality of reactions towards the mask but the diverse identities of the people who reacted, quite like what Wrestlers experience through traveling nearly every day to perform house shows and tag (high five) millions of fans in different Countries. If you type the name of each wrestler I have mentioned, you will gather plenty of information and be able to pinpoint them.